In summer, when the green beans are in season, you can cook them in a very easy and healthy way, using just a few ingredients. What you really need is just fresh crunchy green beans, and to make the dish more interesting you can add tomatoes and spices: tumeric, cumin, coriander and, it you like it “hot”, cilli powder. Step 1. Begin with the preparation of ginger and garlic paste – process equal quantities of ginger and garlic in a blender or food processor. You can store it in the fridge for up to 3 weeks. Step 2. Chop the green beans in small pieces, cut the tomato in cubes. Step 3. Take a pan, heat some cooking oil. Add about 1 tsp of ginger and garlic paste and cook it just for about 1 minute. Step 4. Add the beans and give it a nice mix. Cover the pan and let the beans cook, mix them from time to time. Step 5. After about 5 minutes add the chopped tomato. Mix the vegetables and add spices – add ½ tsp of each spice. Start with tumeric, then add the red chilli powder (if you like it), coriander and cumin. Don’t add too much spices, you still need to feel the taste of fresh green beans. Mix it well to be sure that spices are evenly spread. Step 6. Cover the pan and let it cook for about 10 minutes, then give it a nice mix. Cover the pan again and leave for 5 minutes more. Now you can add salt, do it at the very end. Mix it well one more time, and it’s ready! 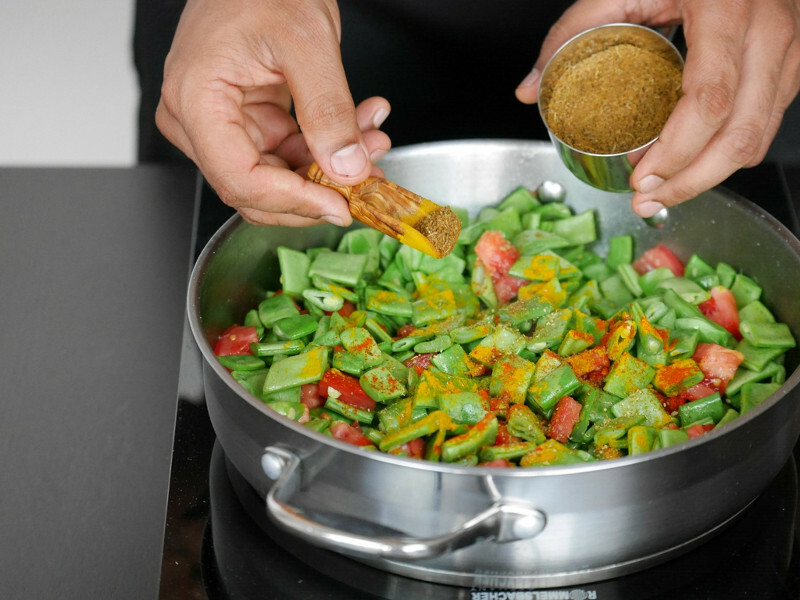 Enjoy your grean beans with spices – healthy, delicious and in season!